Loading docks are often the busiest area of any distribution facility. When trucks are being loaded or unloaded, they become a center of activity with a number of people and forklifts operating within proximity to each other. Usually this is fast work, with the need to quickly load or unload a truck. Everyone involved, from forklift drivers to warehouse workers to truck drivers to bystanders has a role to play in a safer dock operation. Here are some common issues and solutions. OSHA lists some of the potential threats on its official workplace hazards resource. One of the most common (and most dangerous) issues is trailer or truck creep, where repeated impacts from forklifts driving on, in or off the trailer cause it to gradually move away from the dock. As the gap widens, the chances of a gap causing a forklift to fall off the dock edge becomes a threat. This is one of the most common dock accidents, and also one of the most dangerous. 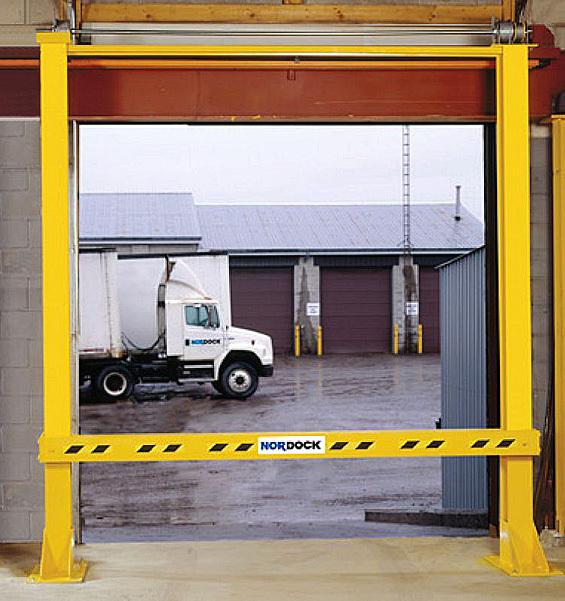 Many dock operations utilize wheel chocks to address this problem, but the safer way is to deploy a truck restraint or other locking device. Dock boards can also be useful in bridging that gap and helping to prevent a devastating accident. Forklift/pedestrian collisions are just a careless instant away at a fast-paced shipping dock operation. A scenario where warehouse workers are staging the load or working near dock doors while a truck is being loaded, and suffering a collision, is all too common. Forklift drivers who have entered trailers cannot see behind them when they back out, except the narrow range of vision framed by the dock door. People coming into or departing that zone also can’t see the lift trucks. This is a particularly dangerous time, since people are in a hurry, there are plenty of distractions, and fast-paced traffic. Take the common sense steps of removing pedestrians from the area when the loading operation is underway when that’s possible. By process, anyone who doesn’t need to be on the dock at this time should not be there. That includes the truck driver, who should be in the office, a trucker’s lounge, etc. (he should not be in his truck to help reduce the chances of a drive-off while work is occurring). Anyone who isn’t critical to loading or unloading should not be present. Those who must be there should be extensively trained about safety near forklifts. Install “blue lights” on your forklifts. These lights project a disc of light on the warehouse floor that precedes a forklift by about 15 feet. They’re economical, and can be installed by just about any maintenance department. We recommend that every forklift be equipped with them, because they do catch the eye of pedestrians and provide an extra layer of warning. Reduce clutter in the staging areas. The basic idea is that clutter leads to accidents, and should be reduced wherever and however possible. Utilize interior dock safety sensors. These are typically hung from the ceiling and detect motion in the monitored area, right behind a dock door, or a group of them (up to 4 doors depending on the sensor model). Bright red blinking LED lights are activated when motion is detected anywhere within the trailer/dock opening, warning that a truck is in the trailer. There are also exterior loading dock alarms that use sensors mounted on the exterior wall of the loading dock, and trigger audible and flashing strobe light alarms to warn of impending danger, should dock personnel be between the truck and the loading dock. Watch out for tail swing. 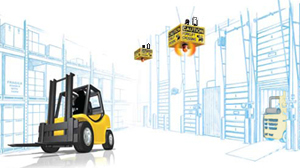 As forklifts turn, the rear of the vehicle swings the opposite direction of the forklift’s rotation. It’s a more pronounced issue than with passenger vehicles ( The This pronounced tail swing means that operators must begin their turn much earlier than they would while driving a car), so drivers must be trained specifically to be aware of it. Due to this, drivers have to be aware of dock edges (as well as doors, bollards, equipment, other vehicles, or pedestrians). For edge of dock fall prevention, forklift-duty dock gates are recommended when there is no trailer at the dock. To prevent collisions with people, consider visibility mirrors, safety sensors, and ZoneSafe or similar proximity alert system. All turns should be executed at slow, deliberate speeds to help reduce tail swing accidents. Keep working surfaces clear and clean. This helps to prevent visibility accidents due to stacked pallets or cartons. But clean floors also assist in braking when it’s needed. Paint the edges of the loading dock to improve visibility. It’s always a good idea to provide drivers with as much visual information as possible. You should re-check paint and striping frequently to ensure it’s bright and defined. Consider using “glowing” photoluminescent striping or paint that can be more visible in darkness or lower light situations. Although OSHA doesn’t specifically mention lighting, it’s common sense to keep the area well-lit by both overhead and dock door lighting that can help drivers see exactly where they need to be.